Indulge in mountain cabin lodging near Asheville NC! The “Cabin at Wildberry” is a 2 unit vacation rental, located at the trailhead for the Red trail. 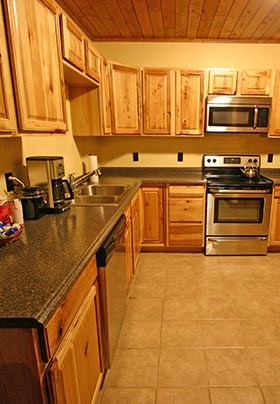 This unique rental suite, located on the ground level of our cabin, includes separate sleeping and living quarters, a full kitchen, washer/dryer and a large full bath with jetted tub and shower. The large bedroom has a deluxe king-size bed and sitting area and is outfitted in hickory and knotty pine furniture. With two deluxe twin-size sleeper-chairs with memory-foam mattresses in the living room, this suite can accommodate up to four guests. The en-suite bath includes two separate sinks/vanities and a one-person jetted tub and overhead/handheld shower. The tub is outfitted with hand bars and a removable seat for those needing assistance. Removable surround for the toilet is also available. Luxury linens and spa bath amenities await you. Enjoy! 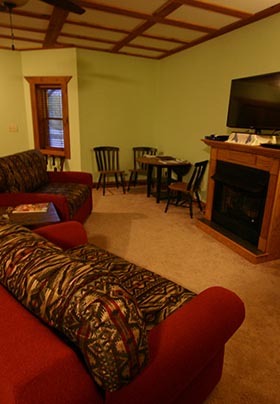 The living room has a gas fireplace, 42″ flat screen television, DVD player, basic Direct TV, and the additional sleeper-chairs that can be made up upon request. The kitchen has a full-size refrigerator, microwave oven, coffeemaker, range with glass top and full-size oven and dishwasher. Pots, pans, dishes, flatware and other kitchen basics are also provided. Breakfast is not included in the cabin suites. As an optional extra, seating capacity permitting, our Cabin guests are welcome to join our bed and breakfasts guests at the Wildberry Lodge for a three or four course gourmet breakfast. The charge for breakfast in the Inn is $18.00 per person per day. We can accommodate most food restrictions if we know about them in advance. If you would like to purchase breakfast for the following day please let Ken or Glenda know by noon so that we may plan for you. If you staying in our Wineberry Cabin Suite and are unable to access the Lodge due to a disability we will deliver breakfast to you. 36″ entry, bedroom, bathroom door width’s to accommodate wheelchair.